The number of cyclists is on the rise in Nepal. Majority of this is contributed to the frequent fuel crises and strikes in the country. But that’s not only the reason. Some enjoy cycling as a form of exercise, some as a means of transport, some are personal enthusiasts who enjoy the freedom and thrill of cycling and some doing their bit for a greener Earth. Whatever it maybe, cycling is being loved all around. And it is a lot of fun. Nepal is a biker’s dream adventure come true. It attracts hundreds of adventurists every year. 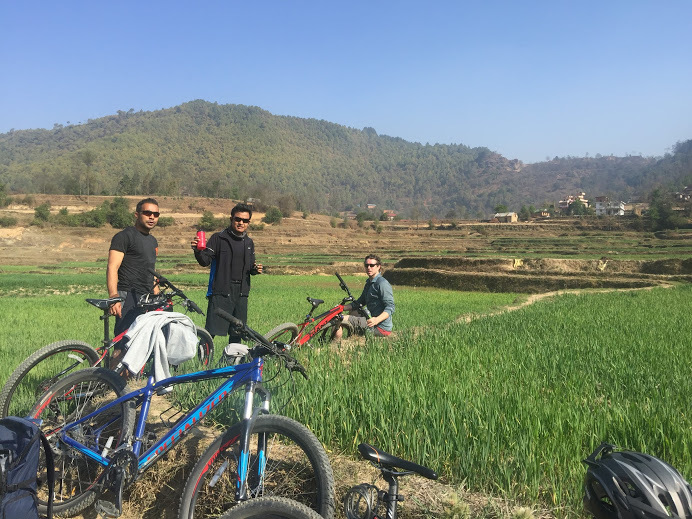 The Kathmandu Valley (Kathmandu, Lalitpur and Bhaktapur) and its outskirts is an ideal place for cycling tours. Why you ask? First, it’s the diverse terrain. Nepal is a country of geographic extremes. The valley is no exception; it has many up-and-down roads and trails that go through both big and small villages and towns. There are many off-road trails (as well as a black-topped roads) that are, if not secluded, at least far from the hustle and bustle of the city. They pass through some serene and unpolluted areas of greens. The dirt trails, excellent for mountain biking, are quite often challenging yet fun, endowed with steep climbs and steeper descents. The trails are, in many places, endless single tracks that just keep meandering through terraced paddy fields and picturesque villages. It’s all something that will make your heart beat with excitement and bring peace to your mind. The next reason that makes bicycle rides so nice in and around the valley is the weather. All around the year the weather’s pleasant, except the rainy season. The summer is not unforgivingly hot. It is rarely so hot that you cannot cycle. In the colder months too, the weather during the day time is warm and agreeable on account of the bright sun and cloudless skies. The third thing that makes Kathmandu Valley oh-so-inviting is the chance to explore the historic cities of Kathmandu, Lalitpur (Patan) and Bhaktapur and the quaint areas in its rims. The scenery you get to witness as you get out of the city roads and onto the hidden trails is magnificent. You’ll be rewarded with sights that make your spirit soar with elation. Most likely, you’ll have splendid panoramic views of some of the most magnificent Himalayan peaks rising high into the sky, as well as a bird’s eye view of the wonderful valleys below. This is actually reason enough to go adventure cycling in Kathmandu Valley. Without further dilly-dallying, I have compiled a list of cycling trails you might want to add to your travel itinerary. The time given are very approximate. This fun and easy ride explores the tracks and trails in the North of the valley. Departing from Thamel, riders need to navigate about 4 km of traffic roads before an easy 4 km climb on a paved road up to Mudkhu. Mudkhu is every cyclist’s favorite place for tea and a chat. You may meet some of the most pleasant people on planet earth. From there on, ride to Tinpipple and then head off-road on jeep tracks and village trails riding through villages and rice fields. The trail hugs the valley rim and offers good views of Kathmandu and a good insight into semi-rural life in Nepal. The trails are easy and undulating with many easy ups and downs and reach the ancient town of Tokha. Return back to Kathmandu on easy roads and test your skills on a few short sections. A mix of off-road trails and the best single track sections in the northern part of the valley. Snake your way through the rice paddies and semi-rural local villages. The ride combines sharp, steep climbs, sweet down hills and single tracks. There are many variations on this route depending on where your heart takes you and also your fitness level and skills. The ride kicks off with a short section of traffic roads to the Nagarjun National Park Gate. Enter the jungle and follow the winding jeep trail on its 21 km climb to the top of the second highest hill of the Valley. Views are great from the top, take time to rest and explore the small monastery and have a packed lunch. On your way downhill, retrace the main trail for 3 km then head right, deeper into the jungle. From from the army check post, savor the great views of Manaslu and Ganesh Himal. From there, the single track fun begins with a fast descent, the trail at times can be overgrown with jungle vines, all the more fun. After the single track, 6km of sweeping flat trail takes us out of the jungle and back to the main road at Mudkhu where you can stop for a little tea break. From Mudkhu, follow cross country trails and fun single tracks before returning to Kathmandu. One of the most challenging rides in the valley indeed. Endure this and it rewards you with panaromic mountain views and around 9 km of single track riding in the dense jungle. The ride starts with a long on road climb of about 27 km to Kakani. The last 5 km of this climb are quite steep. You can stop for rest and lunch in this tiny village and admire the Himalayan views. Thereafter, enter Shivapuri National Park and have a short but tough climb that may involve some push and carry. Things get exciting as you enter the jungle and the track narrows. Technical riding abounds for the next hour or so. Emerge from the jungle and drop almost vertical back down into the Kathmandu Valley. From Thamel, head northwards following the main road for around 8 km on a steady climb to Budhanilkantha. 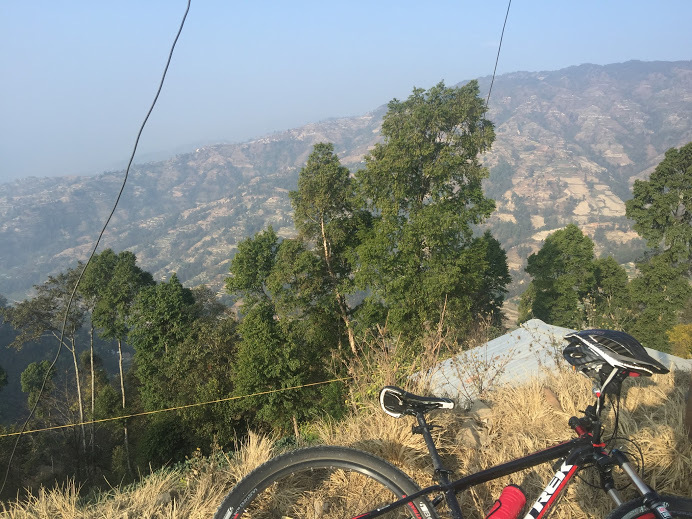 From there on, ride up hill for another 8km on a smooth switch back road that climbs through the jungles of Shivapuri National Park. Past the army college, the road flattens and you can get great views of both the valley and the Himalayas. The next section is popularly known as ‘30 mins of heaven’, a sweeping single track in the jungle with great turns and descents. Re-join the jeep track and climb for a further 3 km before the trail again begins to descend, turn off the main trail for a steep and super technical descent through the villages and the Heli Pad… if you can ride it all! One of the best cross country rides in the Kathmandu Valley. The terrain is varied from paved country lanes, bumpy jeep tracks and sweet sections of single track. Leave behind the city and cycle past Pashupatinath Temple and head cross county through Sano Thimi and climb upwards to the ancient temple of Changu Narayan. Explore the ancient history of the oldest temple of Kathmandu Valley. 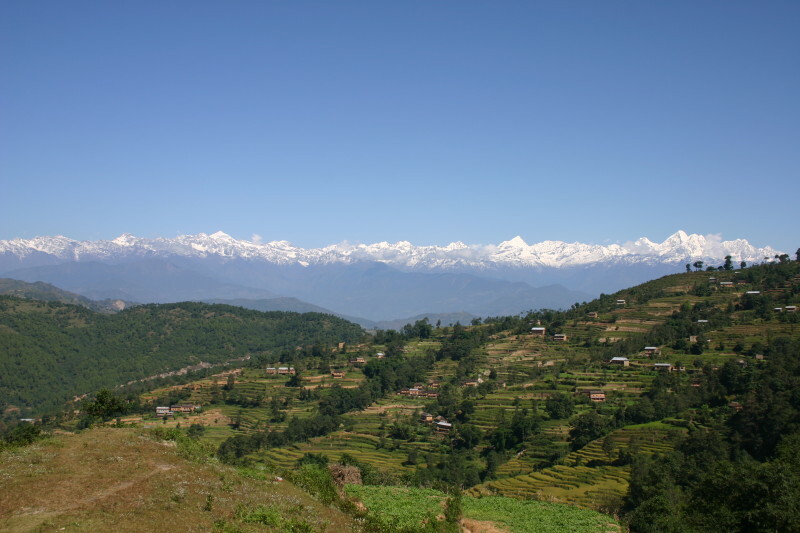 From there, a sweet section of single trail and jeep track takes us through the rice fields to the Newar town of Sankhu. After that, head to Gokarna using a selection of narrow trails before returning to Kathmandu. A great day ride that explores some magnificent rural sections of the valley, ancient villages and some good section of single track plus a spectacular suspension bridge crossing. A fun tour that highlights the rich and varied culture of the Kathmandu Valley. Finish up at Chobhar and test the National Championship Race course before heading back to Kathmandu. This ride passes through Patan and Central Kathmandu so be prepared for some traffic. Take the road to Lamatar from Gwarko, Satdobato, a network of offshoots that emerge from the southern end of Ring Road. From there it’s a steady climb up to Lakure Bhanjyang, the summit of Kathmandu Valley’s eastern rim. There are at least two options for getting to Panauti from Lakure but it’s an easy downhill, although quite muddy during monsoon, until you reach the town on the other side of the ‘Bhanjyang’, which can be literally translated to a mountain pass, or a saddle. Banepa, an important town on the Araniko Highway that connects China, is around 1 to 1.5 hours far from Panauti on a bicycle. Cycle up to Thankot, Kathmandu’s gateway, in the west beyond Kalanki, and then take the downhill turn to its north. A 1 – 1.5 hour ride should take you to Dahachowk. It is a tiny village on the top of a small hill that lies to the west of Kathmandu. Sadly, there won’t be any views of the mountains but the route offers some unique landscapes towards the south of the valley. Further up, the route crosses a saddle and starts going down on the other side. For the next 1 hour it is an exhilarating downhill ride to Bhimdhunga. Ichangu Narayan is another major destination which is very close to this village. It is also one of the four chief Narayan deities in the valley carrying great religious significance. The route finally ends in Swoyambhu, the famous stupa better known as the Monkey Temple to outsiders, after skirting the small hill which the locals have named Halchowk. The above is, of course, just an example of the cycling trails and kind of bike tour that awaits you when in Kathmandu. 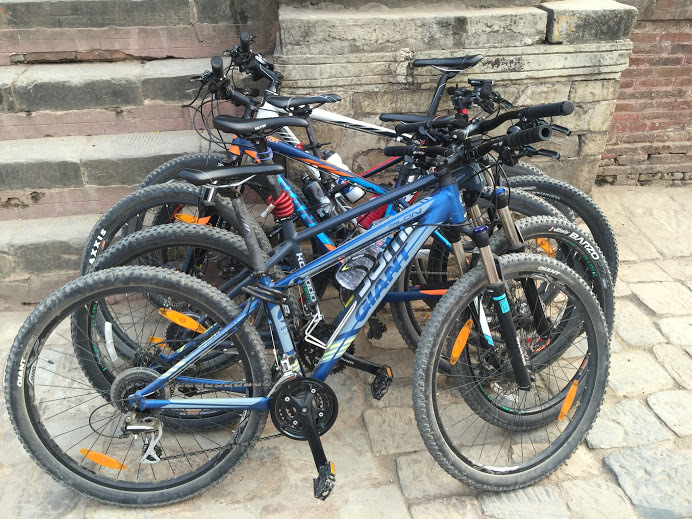 There are many other similarly interesting trails that make Kathmandu Valley a great place for cycling tours.